In my last tutorial, I showed you how to install the Android development tools. 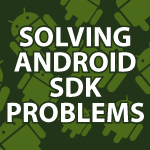 In this tutorial, I’ll show you how to solve many of the Android SDK Problems you have recently sent me. We’ll look at: How to speed up the emulator. Solve the problem in which the Android SDK Manager could not find packages. Solve the Android SDK parse error problems. Solve the issue in which the emulator doesn’t execute your program. If you have any other problems leave a comment below and I’ll solve them. 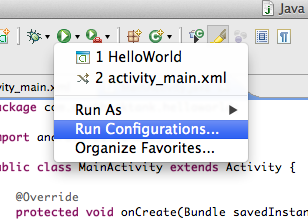 To locate the Android SDK Manager just open it inside of Eclipse. Click Window – Android SDK Manager. The location on your system is at the top of the screen where it says SDK Path, as you can see here. If you couldn’t find it there, then do the following depending on your OS. This will solve both this problem and the Android SDK Manager Peer Not Authenticated error you are getting. If when you open the Android SDK Manager you see this. If when you execute your program, if the Android emulator opens, but your app doesn’t execute, execute your program instead by clicking Run Configuration like you see here. Put a tick in the radio button labeled Launch: and then select your program in the drop down. Then click Run. Click the Android Virtual Device Manager Icon. It looks like the Android robot in a smart phone. This setup works very quickly for me. My emulator loads in about 30 seconds. You’ll need to properly setup Virtual Machine Acceleration though like I describe next. 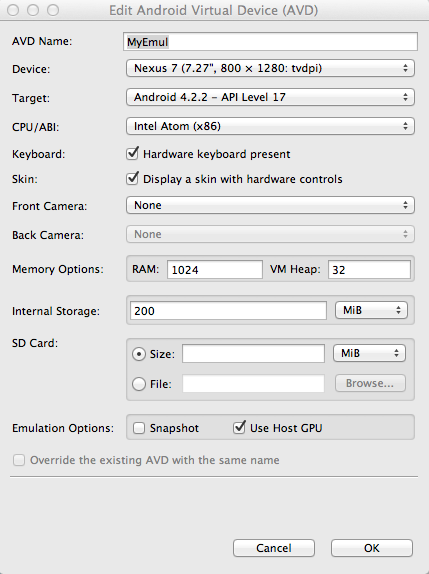 If you are NOT running a virtual machine, you can dramatically improve the performance of your Android emulator. Here is how depending on the OS you are using. 2. Select the package on the left side of the screen and click the radio button labeled Accept License and then Install. 5. Click the Target tab. 6. Click the Target tab. 2. If you’re developing on Windows, you need to install a USB driver for adb. For an installation guide and links to OEM drivers, see the OEM USB Drivers document. 3. If your on a Mac you don’t need drivers. 4. Now that the device is set up for development, on your Android device click Settings – Developer Options – Put a check in the box marked USB Debugging. If I missed anything, or I didn’t cover your specific problem leave a comment below and I’ll do my best to help. For the Android development, do you plan to talk about the NDK ?? [2013-04-25 15:58:48 – HelloWorld] Android Launch! [2013-04-25 15:58:48 – HelloWorld] adb is running normally. [2013-04-25 15:58:48 – HelloWorld] Automatic Target Mode: Preferred AVD ‘MyEmul4.2.2’ is not available. Launching new emulator. [2013-04-25 16:00:06 – Emulator] emulator: Failed to open the HAX device! [2013-04-25 16:00:06 – Emulator] This application has requested the Runtime to terminate it in an unusual way. [2013-04-25 16:00:06 – Emulator] Please contact the application’s support team for more information. You may have to go here http://software.intel.com/en-us/articles/intel-hardware-accelerated-execution-manager/ and install everything manually. Have you tried that? I might be wrong, but checking this video, at 05:15 you say to get intel x86 Emulator Accelerator in order to download VM files. P.S. Thank you so much for what you bring to internet, all your website as well as your videos are in the level of a college course. Thank you for your tutorial!! When I create an AVD, it doesn’t allow me to select a CPU, the combo box is disabled, and “ARM(armeabi -v7a)” is selected by default. I have installed intel accelerator as described. My CPU is intel, 1.6Ghz dual core. Thought I’d drop these solutions to other problems I’ve run into. Anyone new to android, I suggest copy-pasting this comment to a note somewhere just in case, and definitely bookmark Derek’s page! Keep in mind, new android developers, that you probably don’t really need to do anything I’ve listed here until you run into issues down the road, unless Derek already listed it somewhere. // add a variable: Technically, there are other ways to do this, but whatever..
Each time you update your video card drivers, you should check your PATH. When calling Android commands from Ant (And you will), Xcopy is called x10.. This is bad. Your project is being ruined, even though all tasks seem to run correctly. (There is also another reason Xcopy can be called recursively, but I solved that issue without knowing what it was, sorry. I *Think* it was due to Juno leftovers..) This happens because Ant is old, but it’s still awesome and not a tool worth ignoring. To prevent this from happening, simply ensure that all of the locations defined in your path are not duplicates, and (For performance reasons) that the locations they point to really exist. For an example, my complete path for my development environment contains each of the following. It is possible that some ATI card users will have more than 2 elements for AMD/ATI, but they all have to point to something real! The first three will be on all Windows systems, four and five will be -similar- for all ATI card users, and the rest point to variables you should already know about. I’m actually glad I forgot to check path on latest driver update, so I could add that here..
Eclipse auto-completed a method for you, then said it doesn’t exist….? Install the latest/relevant support library..
There’s about 20 ways to fix this, most are listed at StackOverflow here, though Derek might know the ‘best’ way, when the SDK manager can’t handle it. 4	Enter the path to the sources (android-sdk-linux/sources/android-##), or choose the path with “External folder” The folder you are looking for is in the SDK path. btw, grepcode.com has a decent interface for searching the android code, but goes down sometimes. Don’t rely on it being there, but if you’re away from your developer console and get curious, it’s good to know about. Hope anyone with one of these problems finds this! By any chance do you know more about how elements in a path can interfere like I described? For an example, with Ant, if I make two references in my Path to C:\WINDOWS, and then do a Hello world with Ant, it works fine.. but if I do Android Project….. it also works fine, but gives errors as well. I think the errors just create copies of the .prefs, but when I continue with build.xml, whatever those errors were go absolutely nuts.. Like, fill your hard drive in a few minutes with xCopy nuts. Obviously, ATI needs to fix it’s updater, but I don’t know whether Ant should be able to deal with the situation better as well. That is to say – if I can call xcopy as a normal user, Ant’s xcopy task should be the same as mine, no? Also, this is my second tutorial I’ve used. I’ve been working on my first app for a little over two months, and making good progress.. but I had to backtrack a ton after I watched your first 4 or 5 videos, because I realized I actually *was* allowed to follow java best practices, I’d been really frustrated with some of the rules other sites taught me – so thanks for that. I’ve been updating my notes along the way, and at some point I’ll have a really tidy template system built up. If you want me to come back when I’m more confident with the bundle, I’d be happy to share those with your viewers as well, if you’ll host them or point to a git page I could make or whatever. I suggest it because I think your teaching style is absolutely fantastic – you cover a lot of material extremely quickly. A new developer can definitely know which tool they will need to solve a problem after going through your guide. But when referring to your code for a sixth or seventh time, it gets irksome to find what you’re looking for under all the CrazyTipCalc logic, and the StockQuotes, etc. So right now I’m focused on my app, but each time I use the templates I improve on them a bit for that purpose. Let me know if you want them for your viewers, maybe in a month or so..? If you want an example I’ll pastebin some for you. Thanks again for the great series, Derek! I will cover many of the idiosyncrasies of ANT soon. It can be a nasty pain! Yes, if you are willing to post your thoughts as an Android developer feel free to do so. If you want to publicize your blog I am all for that. Sorry that I haven’t been able to answer questions here quicker. I have been mobile lately all of the time and i have no easy way to answer questions. I will be back home again regularly now so I’ll be more diligent. u still didn’t tell how to resolve the “Location of the android sdk has not been set up in the preferences”.. 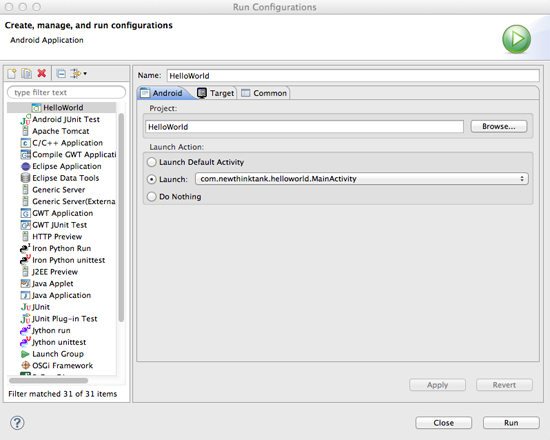 Preferences – Android – SDK Location and find the path to the SDK. My Android SDK Manager wont open it just shows a little box saying Location of the android SDK has not been setup in preferences.I tried to fix this by adding the path manually, but my computer doesn’t have a folder called android-sdks or android-sdk or sdk. I need this to start working asap as i have a deadline to finish an android application.I have also tried updating everything (says there is no more updates). I faced the same problem. How did you solve it? [2013-07-03 12:26:19 – Helloworld] Android Launch! [2013-07-03 12:26:19 – Helloworld] adb is running normally. [2013-07-03 12:26:19 – Helloworld] Could not find Helloworld.apk! This is the error i am facing how to solve it??? What errors do you have in the LogCat panel? When i am trying to install the package….i keep on getting this error. Please solve this issue. Ignore the second answer though that says to install the ADT Bundle. I found it to be very buggy. can i use a debit card instead of a credit card to get the android account open? Thanks for the tutorial. A classmate suggested I take a look at your tutorials and I beelined to this one because of the issue(s) I have been having with my emulators not showing the application. I’ve applied the suggestions in the tutorial re making the emulator faster and specifying what to launch and which AVD to use. “[2013-07-11 10:48:56 – Hello] Automatic Target Mode: Preferred AVD ‘WorkingAVD’ is not available. Launching new emulator. and this hasn’t resolved the issue. I’ve tried to reinstall Eclipse and the SDK and this hasn’t resolved the issue. What version of Eclipse are you using? i show how to set up Eclipse here Install Eclipse for Java. So, you’re saying that you can’t get any emulator to run? Do you have a computer with Intel or AMD chips? What OS are you using? I’ll do my best to help. I’m using Kepler now that I deleted the previous version. Intel chips I guess (a little sticker says “intel Pentium Dual Core inside” – I’m using that to make my guess). I have followed your advise and it solved most of my problems, however I still have some issues, one is I some times get an error on the emulator saying that “Sorry your app has stopped running” or “The emulator has stopped running” the last time I got this the app was there and came up when I clicked it. Also the emulator is painfully slow but I am using Windows 8 so their is most likely not a solution. Any advise you have would be appreciated. The emulator speed is not the real problem. For some reason I keep getting a error on the emulator saying sorry your app has stopped running. It seems to load alright but as soon as I select the app the app screen starts to open and the “Sorry your app has stopped running” comes up. What errors do you see in the LogCat panel that are specific to your java classes? I have a problem. When I click on Android SDK manager, or something that’s related to Android SDK, it saids, Android SDK has not been set up in the preferences. Please help! I’m a Electronics student.i’m planing to develope a android app. But i just have idea about app that how it shold look and how it should work. Since i’m a electronic student i don’t have programing background.I just know C.
But some of my suggested me to learn java for android.So you teach java in this course or do you have any other tutorial about java wgich i can refer?? Hello, If you know electronics you pretty much already know how to program. If you know C you’ll have no problem with Java. I have a massive Java video tutorial, but for Android you just need parts: 1 – 7, 9, 11 – 18. You may also want to watch parts 1 and 2 of my design patterns video tutorial. I review OOP in those 2 videos. Hello! Good day Derek! Your tutorials are wonderful. i’m following your instructions. The problem is, the hello world program doesn’t seem to run. There’s an error in the MainActivity.java that says R.cannot be resolved to a variable. I tried cleaning the project but it didn’t work. How am I suppose to solve this? Thank you! Project – > Clean and restart Eclipse. Make sure you are using Eclipse Indigo with the Android plugin, which is what I use. I cover how to set it up here. It is a lot less buggy then everything else. Ive watched the video but my problem is not in here. All these problems seemed to be able to open the emulator from the the android virtual device manager. Mine does not open the emulator at all. Again, I see the loading bar window appear, but the emulator window never shows up and the loading bar windows closes at about 90% and shows no messages or errors. Please help! Try running Eclipse as an Administrator if you are on Windows. Make sure you shut down background processes that may be causing a conflict. Reinstall outside of the Program Files directory if on Windows. Make sure Java is in your path. [2013-10-17 14:52:22 – SDK Manager] [SDK Manager] The system cannot find the path specified. When I run my SDK manager from Eclipse (Indigo), I get this in console. It updates the packages, but I dont know why I get this path thing: I set the path environment variable to platform-tools and tools folder too..
Also for emulator I cannot allocate 1024 of RAM. It doesnt workd! it works with 768. Thank you very much for your good tutorials!! You’re very welcome 🙂 Thanks for visiting my web site. In this tutorial I show how to install all the new Android development tools. That should clear the errors. Hello Derek i really admire you for you videos i want to say thanks for your good tutorials but i will be happy if you solve my little problem. Derek actually i am beginner for android development, when i open SDK manager a box pops up notifying that android sdk ping has encountered a problem ,pingUsageserverfailed bad version 22.0.3 within details. XML verification failed for http://dl-ssl.google.com/android/repository/repository.xml. I have tried every thing you have shown in your video like checking box corresponding to “Force https://… etc. Derek please tell me what’s all that and how to fix them. Take a look at part 26 of my Android series. I show how to install all the new up to date tools in it. when I run emulator, only shows “Android”. It does not show main screen. After 1 hour of waiting, it still shows the “Android” screen.why is this happening and how to fix this? Thank you for these great tutorial on Android development! Thank you so much for sharing your knowledge! Today, I followed your install tutorial installed eclipse indigo on my Mac. I also installed android developer tools. However, after I created MyFitstApp project, I see gen folder is empty which caused MainActivity.java not complied. I googled it but not successful. In addition, I cannot find Android SDK Manager location by searching the bundle. Please help! You’re very welcome. I show how to install all the new Android development tools here. I noticed that you have the same mac laptop as mine. I got an error on installing the intel HXM hotfix(1.0.7). “VT/NX not present ” which prevents me from selecting x86-based AVD option. You indicated you installed Intel Hardware Accelerated Execution Manager (HAXM) release_1.0.4-hotfix. But I tried to install 1.0.4 hotfix, my machine says that I have a later version installed. Which version do you have when you installed using Android SDK manager? 1. How to make VT/NX present? 2. Which hotfix version should I install to workaround the problem #1. I have mac os 10.6.8 and my emulator is very slow. The links for the Intel Hardware Accelerated Execution Manager, are different from what you provided in the video. There are two links for mac os X and the second link (Hotfix for OS X 10.9 only (1.0.7)) is not compatible with my system. And the first link(haxm-macosx_r03.zip (1.0.6) ) is not what you showed in your video. I cover how to install the new Android tools here. They are much quicker. i have windows 8 ,have latest jdk,sdk manager pops up but then disappear,so i can’t downloaded packages,atom image etc. how to run sdk manager,need help?? I show how to install the new Android development tools here. My Android Studio is displaying the above mentioned error in the ‘Messages Gradle Sync’ Dialog-box.Tell me how to resolve it. Lower the Android version in your manifest file. Hello there, I’m sorry if I’ve somehow missed it, but even though you said you’ll “Solve the Android SDK parse error problems.” I couldn’t find any references to them in the video or on this page. It was recommended on Stack Exchange that I delete my ‘C:\User\___\.android’ folder and restart Eclipse to get rid of these parse errors. Needless to say, that didn’t work. All the relevant packages have been successfully installed using the SDK Manager. I tried various combinations of the “clean” option in Eclipse, and building my project manually as opposed to having it done automatically. I’ve spent days on troubleshooting these and various other issues and I’d be greatly indebted if you’d help me out here! Don’t know why I never tried updating ADT manually through “Install New Software…” ! Shouldn’t have trusted “Check for Updates”. In short, it worked like a charm! Thank you so much, Derek. I was really hoping you’d answer! Much appreciated, my man. Check out part 26 of this series. I show how to install the newest tools. I am a newbie in android application development. i have started to setup the development environment and have installed SDK and eclipse latest version. my computer (DELL Inspiron 1454) doesn’t have hardware virtualization technology therefore I can get the android virtual device run in my computer. is there no way to have an AVD or an alternative if there is to HVT support in your pc? Hi, You need to use the Intel version of the emulator. Check out my new Android tutorial. It will make things much easier. Hi, the Android emulators have been working well until today! PANIC: Missing emulator engine program for ‘arm’ CPUS. Using the SDK Manager, I’ve reinstalled all the Android SDK Tools and Android SDK Build-Tools but the same problem exists.